The time required to evict a tenant depends on the type of notice used and the location of the rental property. It’s important to understand that the time line for the eviction case starts from the expiration of the Notice to Quit – which could be 3 Days, 30 or 60 Days depending upon the circumstances. The eviction case begins at the expiration of that notice which is when the Unlawful Detainer action can then be filed in a court of law. It is essential that the correct notice is properly filed and served or weeks or months can be lost if improperly handled and the eviction process has to be restarted as a result of the case being thrown out of court. The general answer is that it often takes about 45 days for an uncontested eviction from the time of the court filing, and 60 to 75 days for a contested eviction. Once the Notice to Quit has expired it is time to file the Unlawful Detainer lawsuit. The Unlawful Detainer lawsuit is usually filed on the forms provided by Judicial Council for the State of California – except for post foreclosure Unlawful Detainer lawsuit that is generally prepared on 28-line pleading paper. After the Unlawful Detainer lawsuit is filed with the court it must be served on the Defendants. Service on individuals can be performed by 1) Personal service, 2) Substitute service or 3) Service by obtaining a posting order. Substitute service or service by obtaining a posting order requires at least 3 attempts at personal service without success. The time a Defendant must respond to the lawsuit also depends on how the Defendant was served. If service was accomplished by personally serving the Defendant with the Summons & Complaint the Defendant must file a response to the lawsuit in five days. If service was accomplished by substitute service or by a posting order Defendant(s) have 15 days to file a response. Once the Answer is filed a decision must be made whether the landlord’s attorney wants to engage in discovery. Discovery is the process where written questions and a request to produce documents will be served on the Defendant(s) to determine the factual support for the defenses the tenant(s) have set forth in the answer. A request for a trial date will be requested and the court clerk must set the trial in a period of ten to 20 days after the Request for Trial Date has been requested. Depending on the congestion of each court the trial may be on the first trial date the court clerk sets or it may be continued. If the Defendant does not file a response to the complaint a Request for Entry of Default/Default Judgment will be filed, and the court clerk will process that Request as soon as the court’s work load allows. Once a judgment is obtained, either after trial or by default, the Judgment is signed by the judge and is processed by the clerk of the court. The next step in this process will be the filing and processing of a Writ of Possession. This is required to allow the County Sheriff’s Department to post the Writ of Possession on the Rental Property informing the occupants of the date and time of the lockout. This process usually takes at least 20 days from the date of the judgment. However, there are a few delaying tactics a tenant can employ such as filing a demurrer to the complaint, motions to strike and other pre-trial motions are all available to the tenant on the internet or from tenant attorney’s and paralegals available for hire. The tenant can also file a bogus bankruptcy or motion to remove the case to Federal court to delay the process. Sometimes the tenant may find a person who is unknown to the landlord and who may or may not be an occupant to file a bogus bankruptcy claiming some type of possessory interest in the rental property. All of these delaying tactics by the tenant can add time to the eviction process. 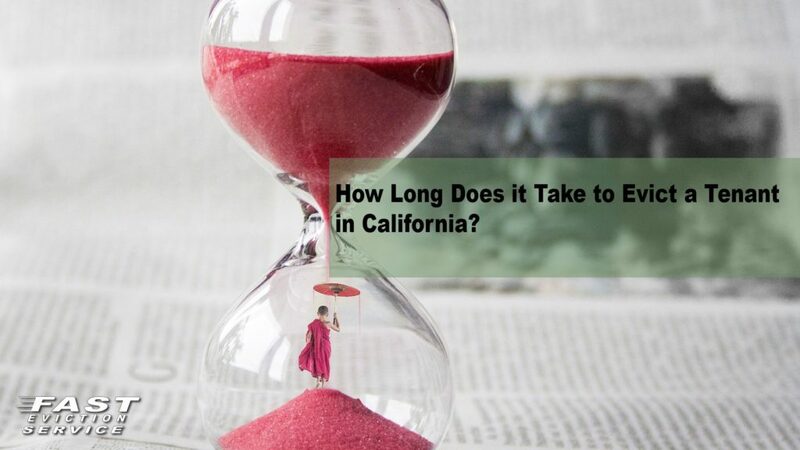 There is also a move afoot in the tenant friendly California Legislature to allow the tenants more time to file a response to the Unlawful Detainer action which could add up to an additional 30 days to this process. The eviction time line can also be affected by whether the landlord is represented by an experienced Unlawful Detainer attorney. An experienced Unlawful Detainer attorney and staff can shorten the intentional delays attempted by savvy tenants and their attorneys by using counter-delay measures. The Evicted Tenant's Game Plan - Delay, Delay, Delay!